In keeping up with "On Wednesdays We Wear Pink", I thought I would post another FO that's been off the needles since March. 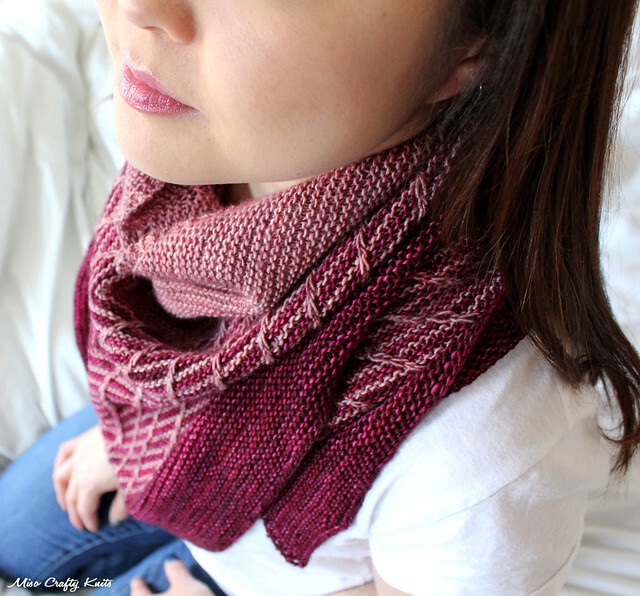 Even though it took me almost 2 weeks to knit up this shawl, I still totally forgot to even blog about it (oops!). But I did Instagram the crap out of it. Oh well, at least I'm blogging about it 2 months after I've finished it and not a year later, right? So what is this loveliness of a shawl that you see above? It's Life on Sundays. This pattern immediately caught my eye with its beautiful simplicity and the endless choices of colour combinations. Definitely a true Veera Välimäki pattern! 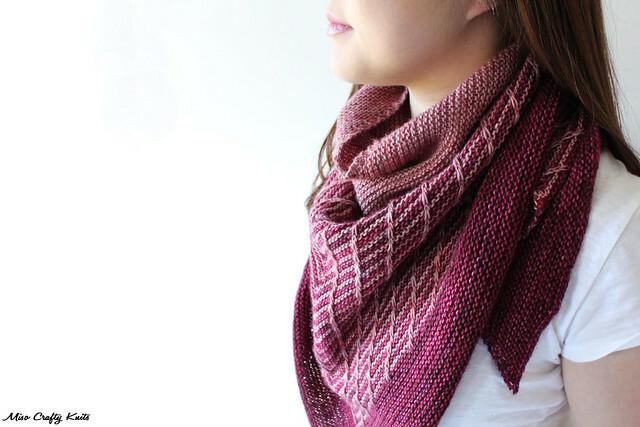 The second I saw this shawl on Veera's Ravelry project page I knew I wanted to knit it, but at the time it was a pattern that was only available as part of a Finnish knit club. Total sad face. Then I forgot all about it...until it popped back up a few months later and I discovered that it was officially available to the rest of the world. Yay! You bet I purchased the pattern immediately and went diving into the stash - where I spent a lot of time trying to pick out just the right colour combo. My poor kiddo was the only person around at the time, and I'm sure he was beyond sick and tired of me constantly holding up skeins of yarn and asking him "baby, do you like these together?" (fyi: the answer was always a flat out "no"). Anyhoo, Life On Sundays is quite an easy pattern to memorize and knit up. I did have to tink back a few times at the start but only because it was apparent that I can't count properly when my mind is elsewhere and not on the task at hand. I also didn't pay any attention whatsoever to the slipped stitches and was slipping them left and right all willy nilly style. Seriously, what's up with me lately? It seems I've had several false starts on every project I've knit so far. Do I need more sleep? Probably. Well, once I got my head sorted and the shawl back on track, the knitting of it was nothing but easy peasy. And by easy peasy, I mean I counted my stitches often and didn't use the aid of a cable needle as called for in the pattern, which made the knitting go a lot faster. Even though the pattern is an easy one, you do have to make a few decisions ahead of time in order to get a consistent look. For instance, I slipped all my stitches purlwise, regardless if it was a right or wrong side row. I also slipped my stitches with the yarn held in the back on every wrong side row, since the pattern made no reference as to which rows to do that in other than 'every row'. 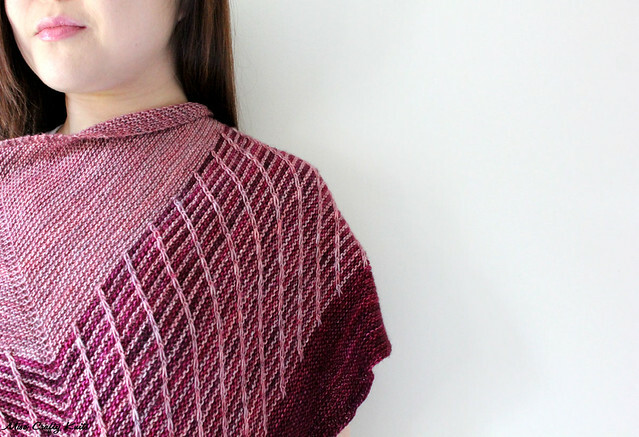 I discovered that holding the yarn in the back for every row resulted in a "bar" across the slipped stitches - which could be a cool look, but I wanted my shawl to look like Veera's, and Veera's shawl had no bars going across any slipped stitches. The pattern hasn't been updated to state this (as far as I know), but I think Veera had mentioned this in the comments section of the pattern page. I believe there's a few projects on Ravelry that has the bar look, if anyone wants to check it out. I think depending on the colours used, the barred stitches can look like beads or mini cables from afar. Another mod that I made (if you can call it that): I had knit a few stripes more than stated in the pattern in hopes of using up more yarn but I chickened out pretty fast cause I wasn't sure if I'd have enough to knit the border (I did). I kind of wish that I had also made this shawl a little wider cause I can see myself wearing this more like a scarf and wrapped around my neck rather than wearing it like a proper shawl. It's long enough to wrap around my neck comfortably, don't get me wrong, but for visual sakes I do prefer to have the ends hang a little on the longer side. I'm picky like that. I'm super pleased with how this shawl turned out. It's super light and airy, yet warm and squishy. I love how gorgeous that Raspberry colour is. I wish the camera could pick up the tonals within that colourway. Really, it's just sooo juicy! I had to stop knitting every once in a while just so that I could admire how the shades of the colour looked all wound up in the yarn cake. So, so pretty! I'm glad I finally found a use for this skein because when I first bought it I had no clue what I was going to do with it. Yes, I'll admit, I was totally swayed to buy it on the colour alone. With no project in mind. I am weak in the presence of yarn! Swoon! I have had a serious VV crush for about two years now, and I'm on my sixth shawl (a varjo, after numerous stripe studies and diff lines). But I'm literally panting to cast on her latest; happy street. Have you seen it? Gorgeous!!! Woman's a genius! Oohhh...and Varjo...I haven't knit that one yet either!! I'm so impressed at how you chose the perfect color combination for this pattern. As for knitting another in gray and black, I think that would be incredible! Aw, thanks Evelyn!! ♥ But I personally think this pattern is one of those patterns where any colour combo would be fantastic! wonderful! The colors are amazing. That's one juicy concoction alright! This shawl turned out gorgeous!! Thanks Preeti!! 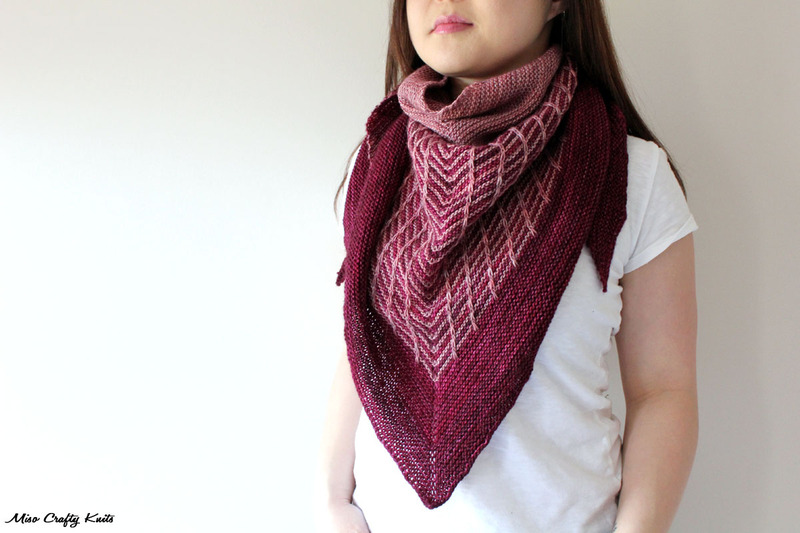 :) It's definitely one of my favourite shawls at the moment! Soooooo pretty! And I loved reading your write up. Felt like we were chatting over tea! Wow, that is beautiful! I think this is one of my favourite knits of yours. That sounds like I'm stalking your knits cause I've never met you. Let's just pretend that doesn't sound weird, okay? :) PS - Great colour choice.